I went to the UHNS this morning for my usual check-up. We got there quite early - which was good as it took a little while to find somewhere to park. All our usual car parks were full - but we noticed that they had oened up the multi-storey to patients now as well as staff. So we parked in there. We didn't have to wait long before being called in. I saw Dr Gahir and another consultant - who said I was looking well. I asked about the scan and they said they'd just been discussing it and that it was just perfect. Nothing to worry about at all. I had the usual camera up the nose and down the throat - and all looked fine. They also said that I have reached my 2 Year Milestone - which seems to be pretty good going! The next one is 5 years - and then they will sign me off. So, I am to go back in 3 months. 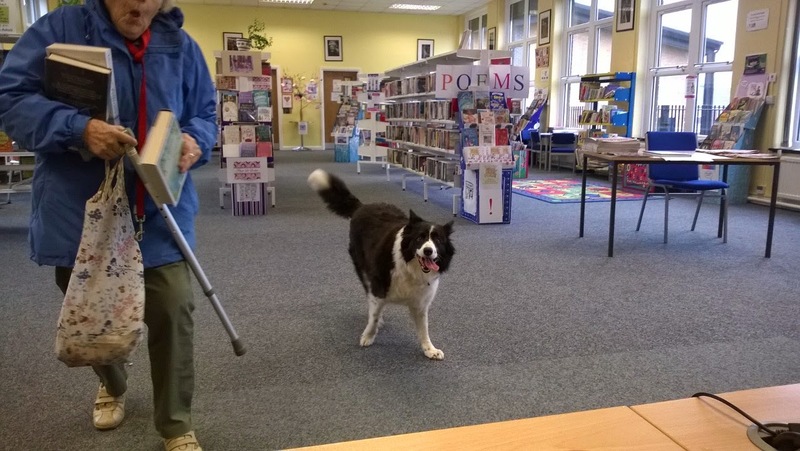 Another thing that made me smile this week was when Molly the Collie (who belongs to Mrs Butler) came to see me in the library on Saturday. She came in with Mrs Gennery - who was dog-sitting for her sister. She is so good-natured and gentle. When she got bored waiting for Mrs G to choose her books - she followed some other customers round the shelves. Then when they stopped - she leaned on them! She did the same to me when I went over to her. She is very affectionate - and loves attention. Maybe we should adopt her as the Library Dog. She's so well-behaved! 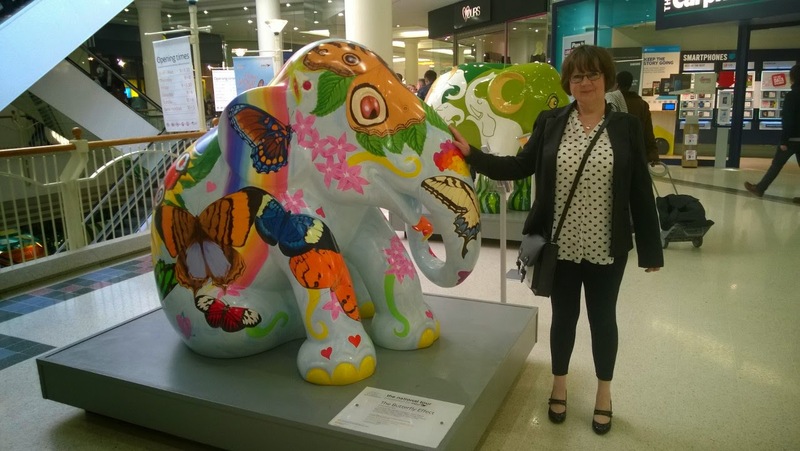 From Elephants and Dylan Thomas to Cortana...an interesting week! 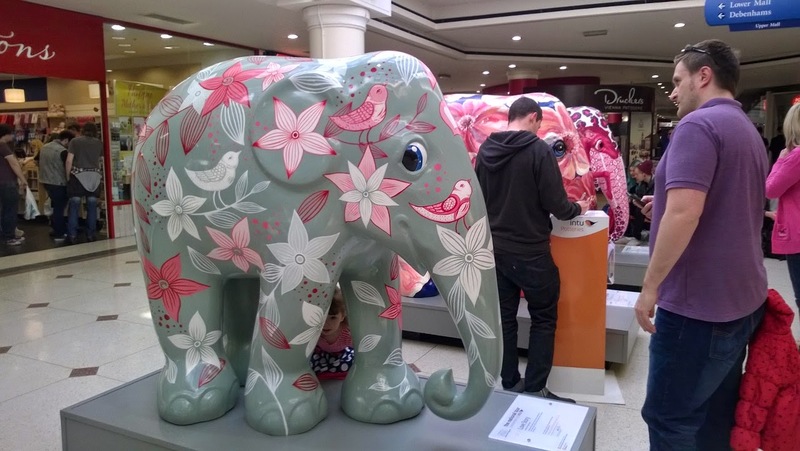 We went up to the Potteries Shopping Centre and encountered some elephants! We only went up there to get Mother's Day cards and presents and met these colourful larger-than-life characters. 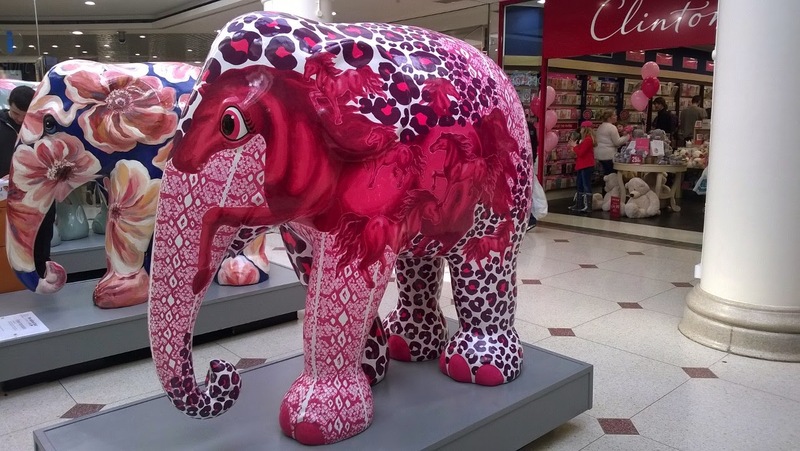 They are part of a nationwide shopping centre tour - to raise money for the Asian Elephant Foundation. 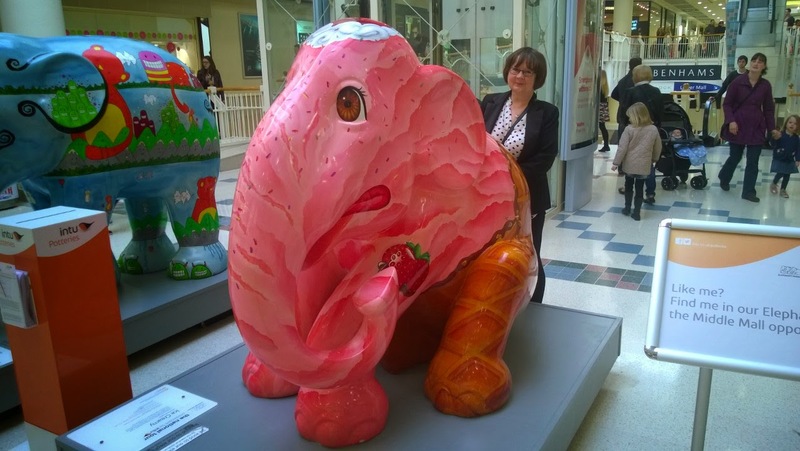 It is called "Elephant Parade"
There's also a pop-up shop where you can buy an elephant of your own to take home - in varying sizes! Luckily not as big as these ones though. 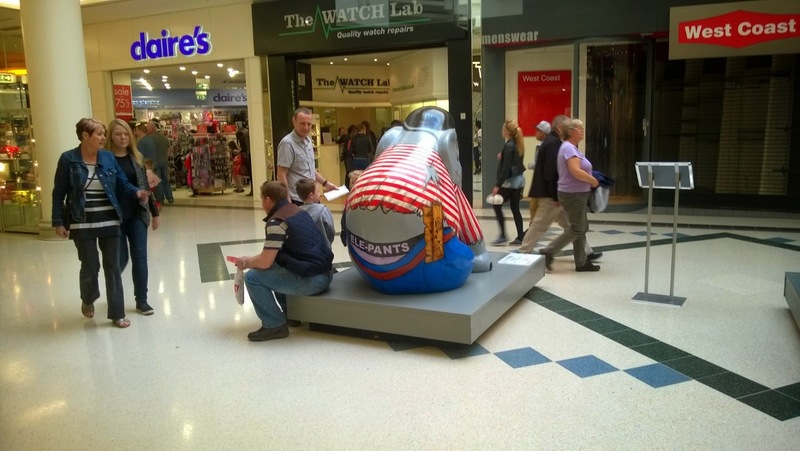 They were certainly attracting a lot of attention so it is definitely a good idea! I think they've been here four weeks - but will be gone soon. So will the shop. Nathan very kindly bought me a small blue one called "Pilgrim" which has buildings painted on it. It is so beautiful - I haven't decided where to display it yet. Then on Monday night I went to see Dylan Thomas reciting his most famous poems and telling some very funny stories from South Wales between the wars. Good going when he is dead - but it was actually a performance by Bob Kingdom - who looked and sounded exactly like DT himself! It was amazing and very moving. It was at the New Vic - just round the corner from my house - and I was lucky enough to go with Caroline - the ringleader of the Keele Poets at Silverdale. We had some very nice food beforehand too at the theatre restaurant. The cauliflower and cannellini bean lasagne was gorgeous - and they do some very nice salads too. We did indulge in some mango cheesecake and Bakewell tart too! We had been working hard though - planning out the event we are having at Silverdale - TOWN by Joy Winkler. We have sold nearly all the tickets - we were trying to work out how many people we could fit in the library! I did not know a lot about Dylan Thomas and his works - but I loved the whole performance. When I went online later to listen to actual DT reading his own poetry - it was uncanny how close Bob Kingdom got. He was electrifying - you could have heard a pin drop we were all so rapt with his voice and so quiet! He did the well known ones like Do Not go Gentle into That Good Night and the wonderfully dramatic And Death Shall Have no Dominion. It was fantastic and very moving! Shame it was only on for one night. We also had a trip to London this week. I had Thursday off - so on Wednesday we caught the train to London. 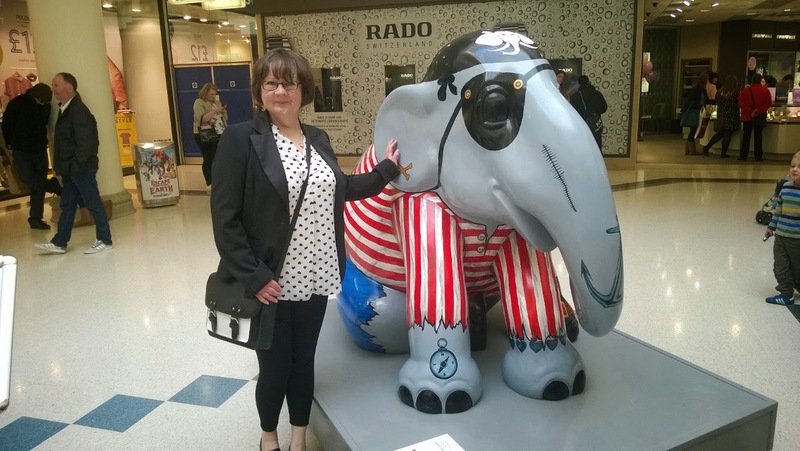 However - just before that Nathan had to go to the North Staffs Hotel with business partner Darren, to meet the lovely Ann King who is the Business Editor of The Sentinel - our local daily paper. She wanted to interview them about Jigsaw School Apps for an article for the Business section. Have a look out for it on Wednesday!! They had to go back on Friday morning to have their photos taken for the piece. Can't wait to see it! As we were a little early for our train we decided to have lunch at the North Staffs Hotel - they do a very reasonable buffet - 3 courses for just £5 - it was very popular it seems :-) The roast chicken in gravy was delicious! We chose a hotel to stay in London through the Secret Escapes website. We told it we wanted to stay near Victoria station and it found us a 4* hotel - but wouldn't tell us which one until we paid! 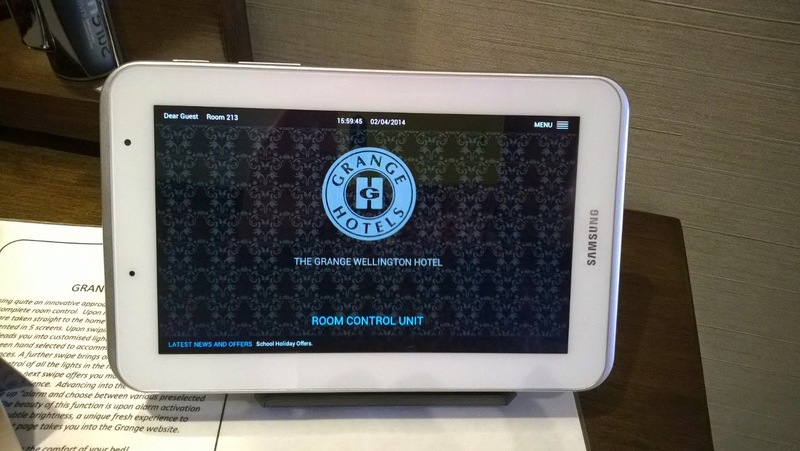 We thought it would be fun to give it a go - and we ended up at the Grange Wellington Hotel on Vincent Square. It was a gorgeous room and Nathan was very impressed with the tablet they gave you to control everything - lighting, air con and even call room service! 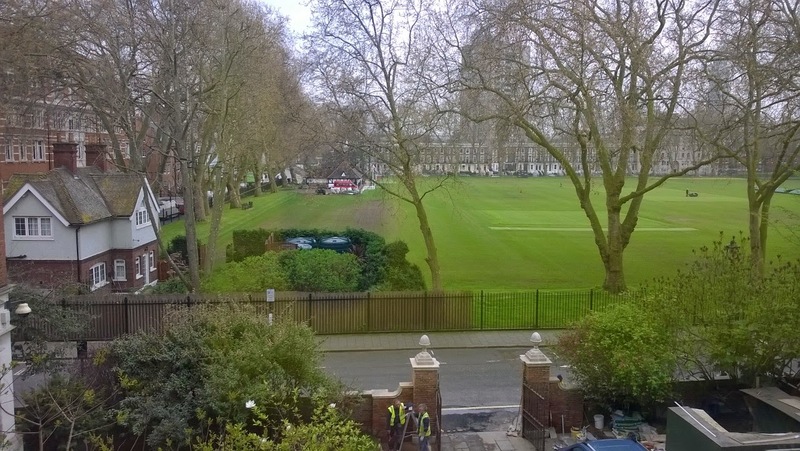 Also, it overlooked the beautiful Vincent Square. It's a shame it was rather hazy while we were there - it was when the Sahara sand was blowing in - all the sleek black Mercedes in the area were covered in brown dust! Nathan enjoying the geeky atmosphere.. 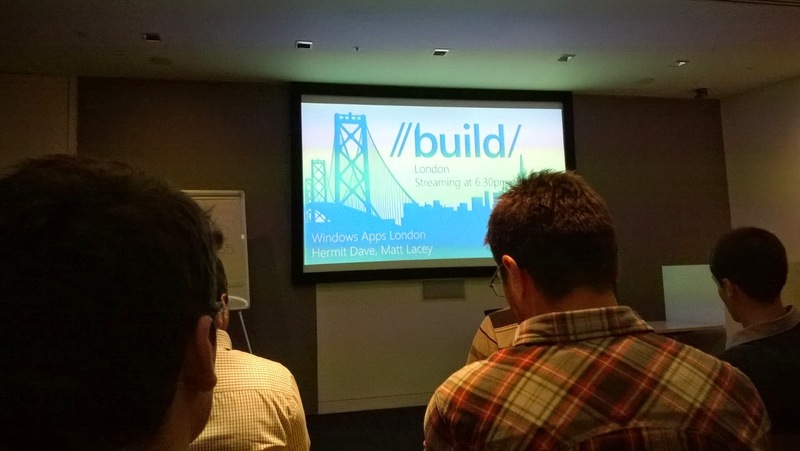 It was held at Microsoft's Customer Centre at Victoria and there were 120 developers there. 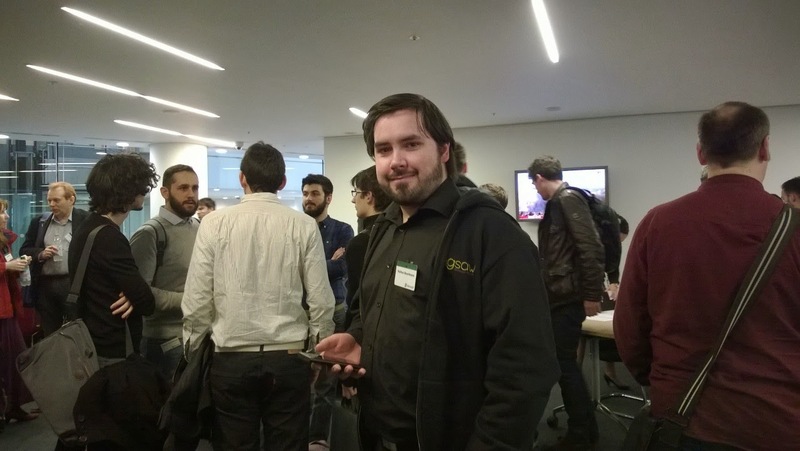 I found it quite interesting - particularly the section where Joe Belfiore showed us Cortana - the new Personal Assistant that will be available in Windows 8.1 for phones. She will read your emails (with your permission) and then arrange your life for you! So, if you are gossiping with friends in the pub she will pop up and tell you that you need to catch a bus to the station as you have a train booked. She saw the confirmation! Also you can talk to her. You can say "Next time my sister rings me remind me to ask about her puppy." Then the Joe's phone rang - it was his sister - and it popped up with a message to remind him! They said that they'd interviews loads of actual PAs to find out what they did for their bosses. 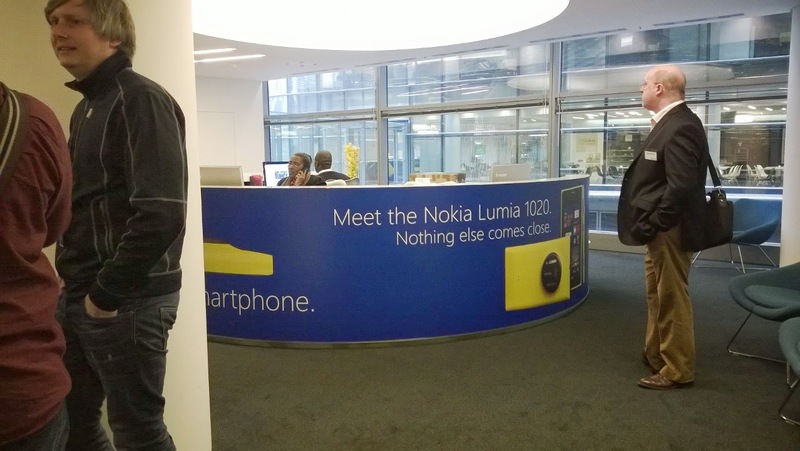 I think Cortana is available from June - unless you are a developer - then you get it next Thursday. We met up with Jodi (who also lives in London) and had a couple of drinks with him after the event. He's recently got engaged to his American girlfriend Claire. Congratulations to them both!! It seems he could be moving across the pond soon. The next day we went to the new Spitalfields Market for a wander round. There were some very unique clothes for sale and some great artwork. We bought Si and Heidi a doormat in the shape of a moustache for a house-warming present! I think they liked it! We had a very nice visit with them when Si got home fro work. The new house is in a lovely quiet area. They took us to their new local The Elephant Inn - which does Thai food! It was lovely - we had a nice chat over food and drink before we had to get the tube back to Euston to get our train home. So, tomorrow I am off to the hospital for my three-monthly check-up. Hopefully will get the results of my recent scan - will let you know how it goes! !